One of only 16 researchers nationwide invited to make a presentation as a “Young Academic Investigator” during the national meeting of the American Chemical Society, Dr. Jeff Johnson of the chemistry faculty was recognized for the distinction during the fall luncheon of the college’s division of the natural and applied sciences on Thursday, Oct. 4. Johnson, who is an assistant professor of chemistry and Towsley Research Scholar at Hope, has been a member of the faculty since 2007. 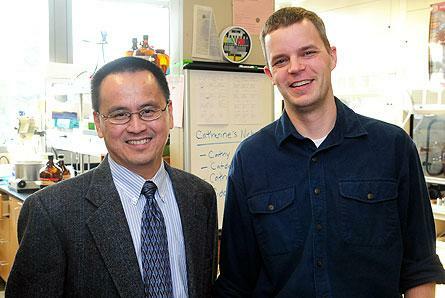 His research, on which he works collaboratively with Hope students during both the school year and summer, is on developing new organic reactivity catalyzed by transition metals. He received the division for the natural and applied sciences “James N. Boelkins Research Promise Award” in March 2012, and was named a Towsley Research Scholar by the college in January 2010.